Chuck Tennessen has embraced environmental advocacy since his childhood on a small Wisconsin dairy farm. Chuck’s compelling “Earthbound” newspaper column, in which he weaves fables of everyday life into the fabric of the global environment, has appeared bi-weekly in the Dodgeville Chronicle since 2013. Earthbound is filled with illustrations done by young artists from the Driftless area of Wisconsin. Chuck Tennessen has embraced environmental advocacy since his childhood on a small Wisconsin dairy farm, where he recalls that Governor and U.S. Senator Gaylord Nelson, and the founder of Earth Day, made environmentalism part of Wisconsin’s atmosphere. His ecological awareness was further honed over 22 years, as Chuck and his wife, Karen, applied their education degrees and idealism to filling a need for teachers in remote Alaskan villages in the Kodiak Island Borough. He completed his educational career as a teacher of students with special needs in southwest Wisconsin’s Dodgeville School District, where he also directed its Green and Healthy Schools program. Avid exploration in the topics of energy and the environment has led Chuck to become a pioneer in renewable energy in his home and community. Chuck helped found and still guides the local environmental action group Sustain Iowa County. He also launched the Iowa County chapter of Citizens’ Climate Lobby, a nonpartisan, grassroots advocacy organization focused on national and international policies addressing climate change. Currently community organizer at the Driftless Area Land Conservancy, Chuck has been influential in facilitating Solar Iowa County, helping home and business owners pool their buying power, resulting in 32 property owners adding 240 kW of solar energy. He has been active in opposing the construction of high-voltage electric wires through the Driftless Area, an ecological national treasure. 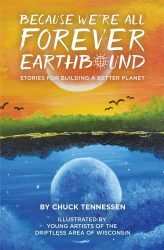 Chuck’s compelling “Earthbound” newspaper column, in which he weaves fables of everyday life into the fabric of the global environment, has appeared bi-weekly in the Dodgeville Chronicle since 2013.